More than 10,000 people in Washington cover health costs not through traditional insurance, but through faith that fellow Christians will step forward to pay the bills. Health-care-sharing ministries have grown sharply in the era of Obamacare, organizers say. 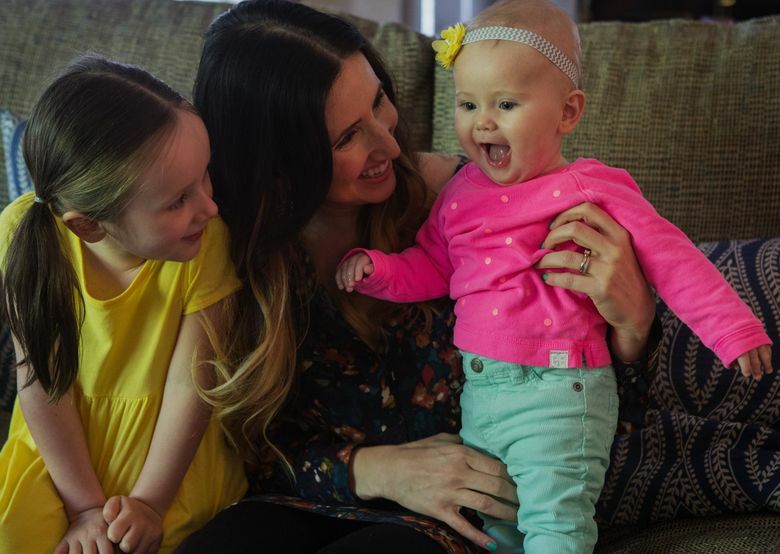 When Melissa Mira suffered sudden heart failure at the end of her second pregnancy last year, she worried first about her health and her baby — then about the more than $200,000 in medical bills that began rolling in. “Your world is just crashing down around you and you wonder: ‘How is this going to be covered?’ ” recalled Mira, 30, who spent more than a month away from her Tacoma home, hospitalized at the University of Washington Medical Center. The Miras — including daughter Jael, 4, and baby Sienna Rain, now a healthy 9-month-old — are among the growing numbers of people looking to “health care-sharing ministries” across the U.S. At last count, there were more than 10,000 members in Washington state and nearly 400,000 nationwide, individuals and families whose medical costs are taken care of entirely through the organized goodwill — and monthly payments or “shares” — of like-minded religious followers. Mira’s husband, Gabriel Mira, 30, a general contractor, had long been a member of Christian Care Ministry’s Medi-Share program of Melbourne, Fla., one of the three top health-care-sharing groups in the U.S. The others include Samaritan Ministries International of Peoria, Ill., and Christian Healthcare Ministries of Barberton, Ohio. “It’s a way to be in touch in a prayerful way with other people,” said Melissa Mira, whose family belongs to Impact Church International, a nondenominational Christian church. Along with payments, the family received dozens of notes of support and encouragement from group members. Health-care-cost-sharing groups, which date back decades, originated with the biblical notion of neighbors sharing burdens. They’ve gained increased attention in the era of Obamacare because they’re specifically exempt from provisions of the 2010 Affordable Care Act, which requires that most people buy health insurance or face fines. They’re an unregulated option for those seeking philosophical or financial alternatives outside of traditional insurance. Admittance is simple. Group members must agree to regular church involvement and get a pastor’s signoff. They also agree to adhere to certain health habits, such as avoiding tobacco, heavy drinking and illegal drugs. And they agree to the Golden Rule: Treat others as they’d like to be treated, sending letters of encouragement or support along with required payments. Members are technically considered self-pay patients; when they visit doctors or hospitals, they’re classified as not having health insurance. Instead of paying insurance premiums, they pay voluntary “shares” of $300 to $400 a month per family, either directly to other members or to plan organizers who match the money with patient needs. “You’re talking $1,000 a month on the exchange, if you want decent coverage,” said Veronika Boos, 31, who gave birth to their youngest child, Desmond, in February. The family belongs to Cross & Crown Church in Ballard. Because the health-care-sharing plans don’t cover routine care and some pre-existing conditions, the couple also enrolled in a local Qliance primary-care medical program to cover preventive care for themselves and the kids, including Leo, 3, and Lucy, 2. But even with that, their total monthly insurance bill is about $650. “This saves us at least a few hundred dollars a month and there’s no out-of-pocket,” Veronika Boos said. Kent Shoop, 67, a pastor with Upper County Community Church in Easton, said he and his wife, Cathy, also 67, joined Christian Healthcare Ministries in 2010 after she retired as a school librarian and they found the cost to maintain insurance too high. Almost immediately, Kent Shoop learned he had prostate cancer. Because the disease occurred before he signed up, it was considered a pre-existing condition. His costs for care climbed to nearly $280,000, part of which was covered through a catastrophic-care insurance policy funded by family and friends. After discounts from providers, the pair still owed nearly $18,000, exceeding the limits of their income. But Shoop was able to join Christian Healthcare Ministries’ Prayer Page, in which members ask for help paying uncovered medical bills. Within 18 months, the debt was settled with small checks from fellow CHM members. “Does everyone on the Prayer Page get their needs met? I think they pretty much do,” he said. Now that the Shoops qualify for Medicare, they use that as their primary insurance, but keep the CHM plan because, at $150 a month apiece, it’s cheaper than other supplemental programs. Medi-Share also offers a supplemental sharing program for people 65 and older. There are certain limits to sharing. If a Medi-Share member is injured in a car crash, for instance, the medical bills won’t be shared if alcohol or illegal drugs were involved, if the accident was part of a competition or a “stunt,” if drivers aren’t old enough or if the incident occurred during commission of a crime. Organizers note, however, that each of the plans has programs like Prayer Page that allow members to request payment for bills that fall outside the rules. Often, fellow members cover those costs, too. In fact, ministry organizers say nearly all needs are met. If there are more bills than payments, the groups may prorate reimbursements or ask members to make up the difference. But critics of the groups, including Washington state Insurance Commissioner Mike Kreidler, say they’re concerned that health-care-sharing plans offer an illusion of insurance but none of the guarantees of regulation. Since then, 29 states have enacted similar safe-harbor laws declaring that the practices are protected and don’t qualify as health insurance that falls ­under regulatory authority. The groups have seen their share of controversy. Christian Healthcare Ministries was formerly known as Christian Brotherhood Newsletter until a scandal led to the 2004 removal of the group’s founder, the Rev. Bruce Hawthorn, and a lawsuit forced Hawthorn and other officials to repay $15 million spent on expensive houses, cars and other luxuries. Medi-Share members filed lawsuits in Oklahoma in 2006 and Montana in 2007 alleging the group failed to pay for medical bills that should have been covered. In the Montana case, former pastor Michael Rowden, of Big Fork,claimed Medi-Share refused to pay for heart-valve surgery after an infection, calling it a pre-existing condition. A jury awarded Rowden $825,000, but the case was later settled confidentially. Several states have forced health-care-sharing ministries to issue caveats informing would-be members that the services are entirely voluntary and shouldn’t be regarded as insurance. Montana doesn’t accept Medi-Share at all. But members of the programs say they don’t mind the absence of an ironclad guarantee. That’s where faith comes in, said Veronika Boos.